Oh my goodness! We need two weeks of this weather to dry things out. You know how I've been talking about pruning the fruit trees and spraying dormant oil...well I got that done yesterday. Sure did. Pruned the rose bushes too. Folks would probably laugh at these fruit trees...this little orchard of mine...consisting of one struggling little apple tree, three peach trees, a wispy switch of an apricot tree, which surprised me with eleven little apricots last summer, two very small plum trees, and two tall lanky pear trees that don't look strong enough to support a pear. Frail, that pretty much describes them all. Bound and determined to grow fruit...I will keep you posted on how we're doing. Keep your fingers crossed! Why did the guineas cross the path? they saw me coming with the camera. Never fails. still not looking at you. I don't think anybody will bother your bear, Eli. and towering far above the goat's lot...is that buds I see? Would you believe, Poppy found two ticks crawling on him when we came inside! He sure did! Mighty early to be getting tick bites. Checking in to say "I survived" yesterday. Thank you all for the nice comments! It was later in the day, like 6:00 to 7:00 pm before the worst of the storms passed over us. There were trees down and lots of damage in several small towns around us, but we were fine. Chairs are blown around in the yard and the pier is under water again...oh, and limbs! It will take a while to push the wheelbarrow around the property, picking up sticks and limbs. That reminds me, Poppy complains occasionally that he can never find a stick on the ground when he needs one; that he has never seen anybody, except me, who feels like every little stick has to be picked up. 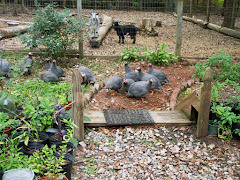 All fifteen guineas made it through the strong winds and heavy rain yesterday. I was out early this morning, even before the guineas flew down. It was nice to look up and see fair skies and the stars and then the sun coming up. Rosie was crying for her milk even before Poppy left for work, so I warmed her a bottle and carried it out. Will I ever be able to wean this little sweetie her from her bottle? Probably not. Was that thunder!!! Dumperoo is a lot like me...he runs and hides when there loud scary noises! He was sitting in my lap last night and I just happened to have the camera in my hand. Better get busy. As you know, I didn't get much done around here yesterday. Sure hope these tall trees can withstand the winds today. 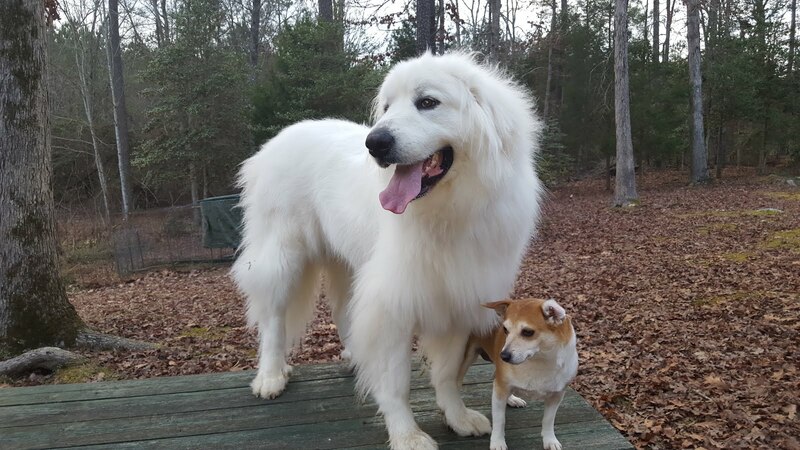 We are under a wind advisory even now. It's wild!! "Oh, d-d-d-d-dear me" says Piglet in Winnie-the-Pooh, and that's what I'm saying too! Lynn and Andee both have always said I remind them of Piglet! Friends, I feel like Piglet this morning, with warnings of this severe weather we have headed our way. It is so scary! Thunder and lightening and wind and tornadoes...it scares me terribly! My great fear of storms came from my dear sweet mama...bless her heart. Daddy used to say to mama, "I had rather something go ahead and get me, than have to go around scared and worried all the time". Well, I don't want something to go ahead and get me! You have probably seen this old picture of mama and daddy posted here before. 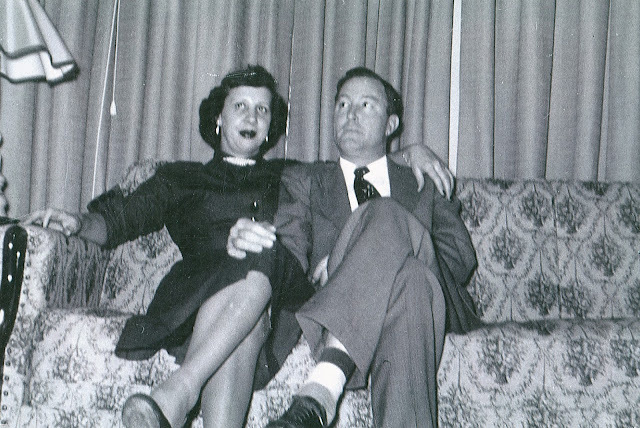 It was taken in the late 1950's...truly the good old days. I remember there being the occasional thunderstorm back then...I do not, however, remember there always being some kind of severe warning. Why, you can't turn on TV these days without hearing some kind of warning. Wonder where mama and I were headed here....running from a storm maybe! 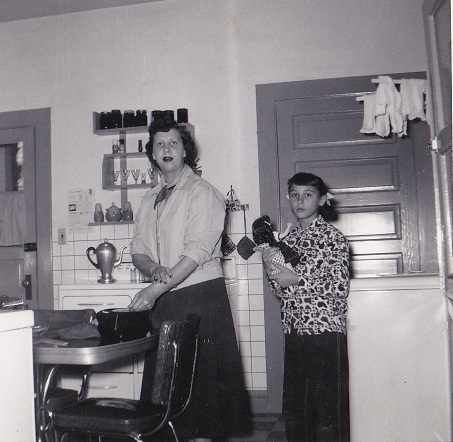 Actually, mama didn't start running from storms until she was in her seventies and living alone. She kept a little overnight bag packed and if it thundered or the weather looked threatening, she jumped in the car went to a neighbor's house. You know, my hiding places from storms have been in the Goodwill store, lots there to keep one's mind off the lightening and thunder, and the Hospital waiting room...nice sturdy building! Now, however, Poppy says, you need to stay put...what if something happens and the animals need you. Last night I called my friend Nellie to tell her my worries about the bad weather predictions for today. She said, "I don't even have the TV on, I'm ironing". She said, "as soon as I feed up, in the morning, I'll come on over there and stay with you". Thank you Nellie! Bet you thought you'd seen the last of me! Well, I'm back! Poppy is off work on weekends now and is counting down the weeks until retirement...just last night he said, seven weeks to go, Mel. Seven more!! He plans to work part time...maybe three days a week. this heavy pan of sweet potatoes. Our friend Nellie popped in Saturday evening at the edge of dark. Nellie is a character! I know where we can get a bushel of the best sweet potatoes you've ever tasted...for $18.00. Oh my goodness, I would LOVE to buy some. You want to split a bushel, she asked. I just might go on tonight and get us a bushel, she said. See you later! Wait, let me give you some money. Nah, she said, just wait. We said our goodbyes and she backed out of the driveway...but wait, the dogs were barking again, it was Nellie back up on the front porch...here, she said. I meant to give you this pack of coconut cookies. Get you a glass of cold milk and eat a couple. They're good! That's Nellie! Less than an hour later Nellie was back with the potatoes. Get you a box she hollered from the car, I ain't got time to come back in. There a man up near Littleton who makes his own country sausage, $3.00 a pound. I ain't even going to stop at my house, just going on up there and see if he has any. Nellie called me later to say she bought his last three packs. Nellie is truly a character!! The most free-hearted person you'll ever meet! Don't know exactly Nellie's age but probably in her early 80's. Nellie lives alone in a small older mobile home...totally surrounded with arbors and vines, and flowers and old buildings with chickens and geese and turkeys and peacocks. 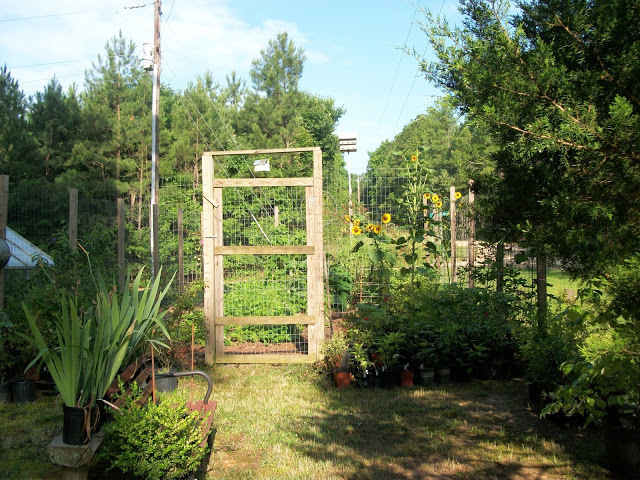 Goats in the front yard and rabbits in cages. She loves animals. Nellie has an old beat up pick-up truck that she drives for hauling stuff....there is a plastic dove wired to each side mirror on the truck. Nellie goes to town every Friday to buy groceries, and pick up feed for her animals...fifty pound bags of feed that she still unloads herself. Amazing! Since I did not reply to the much appreciated comments on my last post...Karen at wyndsonfarm.blogspot.com , you may have been right about a couple of Jewel's chicks being roosters. Out of the eight that she hatched, two, plus little Jewel herself, disappeared. Snatched away, probably by a fox, poor chicks. 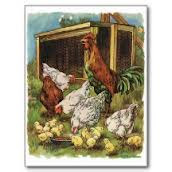 It's still rare that six turned out to be hens, don't you think? Plus the one chick she hatched earlier in the spring is a hen too. All the hens have started laying and I'm getting around a dozen eggs a day! Had more to tell you, but friends, I have simply got to get busy. Time is flying! The floors need vacuuming, and the kitchen needs mopping...there are clothes washing, and clothes in the dryer, and another load on the floor...oh well...hope to be back soon! Look who loves to feed Rosie! Looking out at blue skies and bedspreads blowing in the breeze...why, you would think it spring for sure. Actually, we started Wednesday morning off with more rain...that's right, more rain! But while Weetie and I were sitting in the vet's office, the sun came out. The high winds and hard rain from the line of storms that came through Monday morning soaked everything on both porches. Do you enjoy looking out a window? I sure do! Something else I got from Mama. Anytime she was not busy cooking or cleaning, she was standing at a window looking out. It's hardly daylight when the guineas fly down from the cedar tree and gather near the front door...knowing I will be out with a bucket of feed. Guineas are fun...loud, but fun. The noise from these fifteen can be deafening. They are quiet most of the time, but let a stranger pass, or any critter that doesn't live here, or a snake...especially a snake and they alert everything within five miles...their noise alerts Eli and Weetie to bark, and then the rooster to squawking, alerting the hens, then the hens begin that loud alarm squawking and run for cover...it's deafening!! If Poppy is here, he lets loose a loud whistle ...which is deafening too, and then everything quietens down. Most seem happy and content, and are laying again. Remember the eight chicks that little jewel hatched last summer. 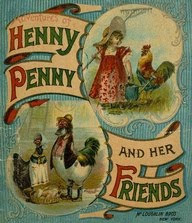 Well honestly, I think all of them are hens, which is hard to believe. Not even one looks like a rooster and surely by now I would be able to tell. Right? The new hens are laying too...small eggs, but they are laying. Dear friends, I am bound and determined to put this post, such as it is, out there. It has been in the works since the first of the week! :) Monday seem so long ago, I can't remember. Tuesday was a dentist appointment and Wednesday a vet appointment for Weetie...which took up the better part of both mornings. Yesterday, lo and behold, I found a minute to rake leaves. Once this weird weather settles down I will finish painting Poppy's shop. That section of red is all that's left to paint. Can you imagine leaving just that much. Once I tire of doing something...I'm done. Well, not really. Actually that is the highest end of the shop and requires standing pretty high up on that ladder. It will be finished!! Deb, over at justcats-deb.blogspot.com , one of my favorite blogs...everything is totally cute at her place, asked about our sweet Smokey. Thank you Deb. Well, here's the big boy stretched out on the bed in the sewing room. When Smokey was just a kitten, a mean, heartless person threw him out. After two nights alone in the woods, he found his way to our house...actually he followed our guineas home. I could hear his desperate little meows, but could not find him. We made it through the coldest weekend only to wake up to sleet and snow this morning. Poor guineas, who love hot weather, have had it! They flew down from the cedar tree and made a dash for the bare ground under the back porch. We rarely get a big snow that covers everything and looks pretty. Nope, we get just enough to be messy and dangerous. 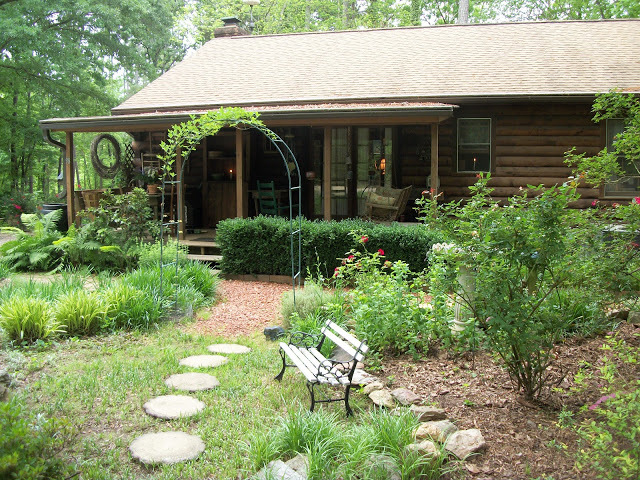 I want to clean out flower beds and rake up the big brown oak leaves that have blown and settled against the house. The windows and screens need washing and the porches need cleaning. Will the place ever look pretty again! Guess I'm not the only one waiting for spring! Better get busy. Got lots to do and good grief! The living room floor!! Might as well get out a new vacuum bag...or better yet, bring the pitch fork inside. Lots of static in the air lately and pine needles have been clinging to Eli's fur. 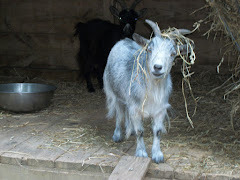 Yep, all that pine straw that I love so! Clinging to Eli and then dropping off on the living room rug. Wonder if the wheelbarrow will come through the front door? Again, back to the sewing room! Let me see if I can get my mind off hay and think about something else. What I need to do is run my sewing machine wide open...get some things made and ready to sell. That reminds me...several years ago I was having some dental work done and being nervous and afraid, the dentist agreed to give me laughing gas instead of Novocaine. Well, it worked, it worked perfectly! Never laughed as much in my entire life. The whole time the dentist was drilling, I was dreaming it was mama sewing, and I had never heard her machine sew that fast. It was cracking me up. How the dentist got the work done is beyond me. I was right embarrassed when the gas wore off. It sure looked to me like the dentist and his assistant were smiling. Speaking of sewing...pardon those silly glasses. Those were my very first reading glasses...out of style, but my favorite eye glasses to wear when sewing. Finally got two aprons cut out! My little bit of sewing time last night was spent making bias tape. Bias tape is expensive and the pattern I'm using calls for three packs at $1.87 each. Sometimes I feel totally burned out with sewing. 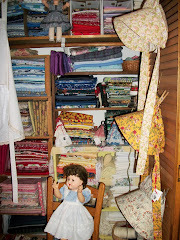 Gosh I've been making and selling bonnet, aprons, and dolls for about fifteen years now. 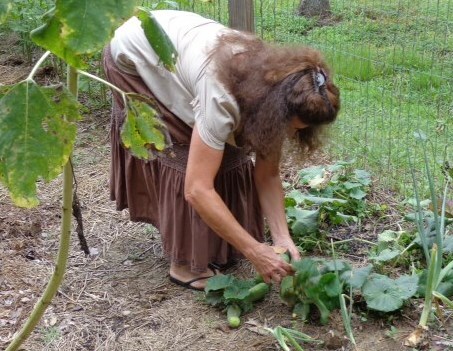 After retiring in 1999, the excitement of staying home, keeping house, and gardening, well, it was overwhelming! A dream come true! I am surprised the sheer joy of it all didn't cause my heart to stop. Many a morning I got up at three o'clock...thinking, "wow, I am retired! I don't have to make that long drive to Raleigh this morning, work all day, and then make that long drive home "! I used to leave for work somewhere around 6:30 a.m. and got back home around 6:30 p.m. 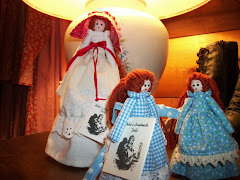 Early one morning, sitting in the spare bedroom, wondering what I could do until daylight, I picked up an old fashioned clothespin and tried making a doll. My first clothespin dolls were pretty tacky...but you know what? I made a shoe box full of the tacky little dolls and carried them to my first ever craft bazaar...the dolls were a hit. Wish I had a picture of those first funny little dolls. 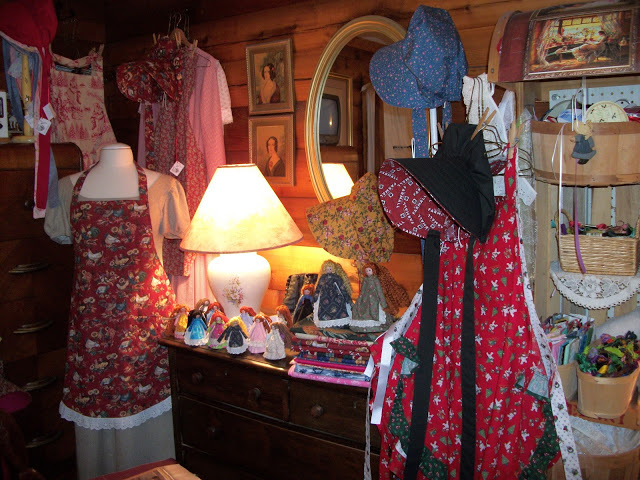 At that time, we only had the spare bedroom, no sewing room. That craft bazaar was totally fun!! 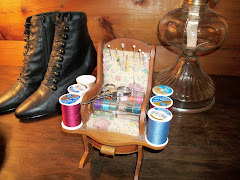 I wanted to do more...that's when I turned the little bedroom into my teeny tiny sewing room..."my space"! I sawed and carved and sanded until the stick looked pretty much like an old fashioned clothespin. 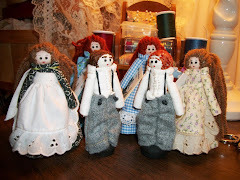 Wish I had kept a count of just how many dolls I have made. Okay, talking about all this has maybe inspired me to cut more doll sticks and get myself busy. There will be no cutting maple saplings today, it is cold outside, and that wind, brutal!! Didn't mean to go on and on...I sure get carried away with stuff. Why, if it's not hay, it's the sewing room! Coming down from a hay high! and there in the window is that pesky alarm clock! as soon as the bed was made, a crowd gathered. and look, we have oodles of shopping bags...why I don't carry one with me to town is a mystery to even me!! Somebody else enjoyed the sun in the goat lot yesterday. She likes her own little pile of hay on top of the carrier. Thank you for putting up with me. Seriously! Better get busy. I am going to town again today...for hay, and of course, for things we need from Walmart. The weatherman mentioned show flurries for tomorrow and that means the stores will be packed with nuts (like me) preparing for a storm. Not really, we are actually out of milk and bread and yogurt. A teeny tiny video...that actually loaded. Isn't she cute! It's been three years, today!